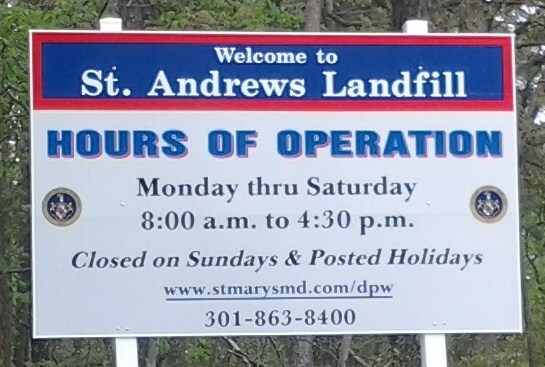 St. Andrews Landfill: 44837 St. Andrews Church Road - The St. Andrews Landfill Facility is located on St. Andrews Church Road, MD Route 4, approximately 1 mile south of the intersection with MD Route 235 on the left. A portion of the site was formerly known as the McLeod Sanitary Landfill. The current site is comprised of approximately 270 acres purchased between 1971 and 1984. Active land-filling operations under the authority of the Commissioners of St. Mary's County was conducted between 1974 and 2001 under a State approved Refuse Disposal Permit. Phase 1 of the Area B closure was funded through a Maryland Water Quality Revolving Loan Fund low interest loan. Post-closure monitoring continues to this date. Please contact our Scale House attendants at (301) 475-4200 ext. *3551 if you have any questions regarding our facilities. 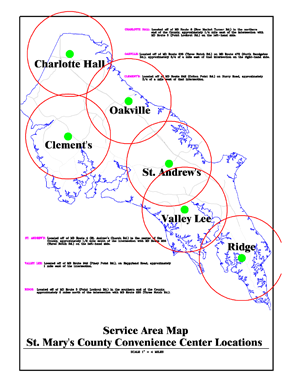 Clement’s Landfill: In April 1987 , a study was completed by Gannett Fleming Environmental Engineers, Inc. to evaluate the feasibility of expanding the site into Area III for eight (8) years of additional capacity or converting the site into a home-owner drop-off center with an expansion to the St. Andrews landfill. The latter alternative was chosen as it was projected to be less costly over the 10 year planning period. The Clement’s Landfill property, formerly a portion of the Tennyson Farm, was purchased on July 28, 1971 and land-filling operations continued until May 1, 1989 under a State approved Refuse Disposal Permit. The original site was 47.428 acres and is owned by the Commissioners of St. Mary's County. Post-closure monitoring continues to this date. Oakville Landfill: This site was formerly known as the Cape St. Mary’s or the Sandgates site and was utilized as a waste and tire disposal area by residents prior to it’s purchase by the County Commissioners on August 1, 1967 and March 31, 1969. Effective July 1971, Rules and Regulations governing the disposal of material at this site were adopted. The current site is comprised of 244.75 acres. Old Hollywood Landfill: Approximately a four acre area on the initial 208.35 acres acquired in 1968 for the St. Mary’s Airport (part of property now formally dedicated for airport use as a part of the Captain Walter F. Duke Regional Airport at St. Mary’s County) was used by the residents of the County for the burial and disposal of solid waste. Charlotte Hall - 37766 New Market Turner Road:Located off of MD Rte 6 (New Market Turner Rd.) in the northern end of the County, approximately ¼ mile east of the intersection with MD Rte 235 (Three Notch Rd.) on the left-hand side. The site occupies approximately 79 acres of the 118.65 acre parcel acquired on 12/4/78. Construction Base Bid for Convenience Center (April 1992). Oakville - 26630 North Sandgates Road: MD Rte 235 (Three Notch Rd.) on MD Rte 472 (N. Sandgates Rd. ), approximately ¾ mile east of that intersection on the right. Opened in 1981. Clement’s - 24547 Horseshoe Road: Located off of MD Rte 234 (Budds Creek Rd. ), on Horseshoe Rd, approximately ¾ mile west of that intersection. 47.43 acres. Opened after 1987. St. Andrew’s - 44595 St. Andrews Church Road: Located off of MD Rte 4 (St. Andrew’s Church Rd.) in the center of the County, approximately ½ mile south of the intersection with MD 235 (Three Notch Rd.) on the left-hand side. The original acreage for this site was acquired on 2/11/87. Opened in November, 1990. Valley Lee - 45350 Happyland Road: Located off of MD Rte 249 (Piney Point Rd. ),on Happyland Road, approximately 1 mile east of the intersection. The original 165.17 acre parcel was acquired on May 5, 1970 and in June 1996, a 48 acre portion was exchanged for a wetland mitigation site. Opened prior to April 1993. Ridge - 13939 Point Lookout Road: Located off of MD Rte 5 (Point Lookout Rd.) in the southern end of the County, approximately 2 miles north of the intersection with MD Route 235 (Three Notch Rd.). Since 1976, approximately 4.5 acres of property was leased until purchase of a formal site on May 24, 2001. Opened in 1986.